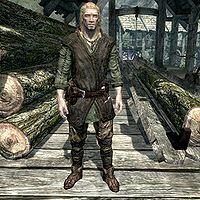 Bolund is a Nord warrior that owns and operates Falkreath's lumber mill. He lives in the general store Gray Pine Goods with his brother Solaf. He tends to have a rather rude personality. He will sell lumberHF to you if Hearthfire is installed. From 7am to 8pm, he wanders around the sawmill, cutting wood. At other times he will wander the town, sometimes being in the store and sometimes visiting the inn. He never sleeps. He wears farmer attire, including clothes and boots and carries his copy of the key to Gray Pine Goods, an iron dagger and a selection of common items and gold. If you are a Nord he will greet you with: "A hearty welcome to Falkreath! All of Skyrim's true sons are welcome here!" but if you are not a Nord he will simply say: "I can't believe we let provincials like you wander Skyrim." If you play as an Argonian he will be downright hateful and say: "Stay out of my way, boot." He may further demonstrate his dislike of outsiders and Imperial sympathizers when he remarks: "You'll find my brother Solaf and I are the only true Nords in Falkreath." He also dislikes local innkeeper Valga Vinicia and will say: "That Valga Vinicia is a gossip and a troublemaker." His brother Solaf is a true Stormcloak, although much more forgiving than Bolund. When asked about his brother he will say: "His name's Bolund. He's the one who works the lumber mill down by the river. If you meet him, don't expect much in the way o' conversation. He ain't one for talking, especially with folk he don't know." and "Don't mind Bolund. He's young and gets riled easily." Even when you enter Gray Pine Goods for the first time, he will make excuses for his brother: "Well met. Unlike my brother, I've no dislike of strangers." He will only exit Gray Pine Goods if you enter the shop, and therefore will not be found at the mill when entering Falkreath. This page was last modified on 24 April 2015, at 02:06.